These Rainbow M.E. shorts are originally of Ron Hill brand, but while I tended the sports shop Rainbow Mountain Equipment in Copenhagen we bought several kinds of sportswear to ourselves with the Rainbow M.E. logo printed on, to be used for training and for the annually relay run in the nearby park. 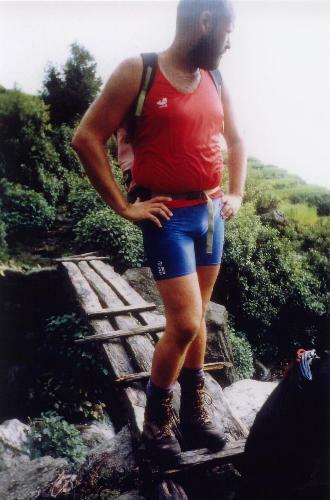 These are the shorts I mostly used for running, but when in 1997 I went on an expedition to Makalu in Nepal, I found it right to show the name again, although the shop long had been closed by then.